Following up on our Design Explorer Announcement post last month, this second post in our Design Explorer series will explore the idea of the design space by looking at a small set of historical precedents and contemporary like-minded projects. By describing the natural history of this family of concepts, we can develop a better sense of how the idea of design space is moving away from the fringes and into the mainstream. The timeline below is an attempt to position Design Explorer as part of a broader trend towards design-space-thinking in the AEC technology community. It is by no means meant to be exhaustive, and I’m sure there is a ton of work out there of which I am unaware that could further describe the natural history of the design space. It is a curated timeline from the author’s point of view. (1941) Borges; Library of Babel. I came across this work in Kevin Kelly’s Out of Control. Borges writes about a vast library containing all possible [410-page, specifically formatted] books. Although most books are filled with utter gibberish, the library contains every book ever written. Kevin Kelly talks about visiting this [fictional] library while he is writing Out of Control and deciding that instead of finishing the book himself, that he will develop a method of searching the library for the already-complete copy of his book. This idea of searching – the method, as he calls it – is a vivid example of design space navigation. (1979) Hofstadter; Gödel, Escher, Bach. We could draw on a number of examples from this amazing book, but I think the high level survey is more meaningful. At various points, Hofstadter talks about protein folding space, the space of all meaningful mathematical expressions, the space of all possible fugue variations given any starting melody, etc. It turns out that mathematics has been concerned with these questions much longer than we have in AEC! No surprises there, I suppose. 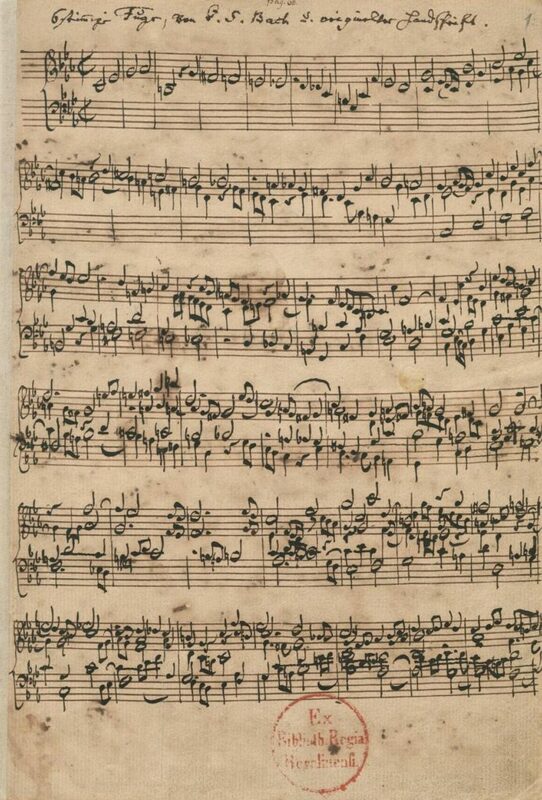 A six-part fugue by Bach (Source). (1986) Dawkins; The Blind Watchmaker. In the third chapter of The Blind Watchmaker, Dawkins expounds about a computer program he developed called Biomorph Land. 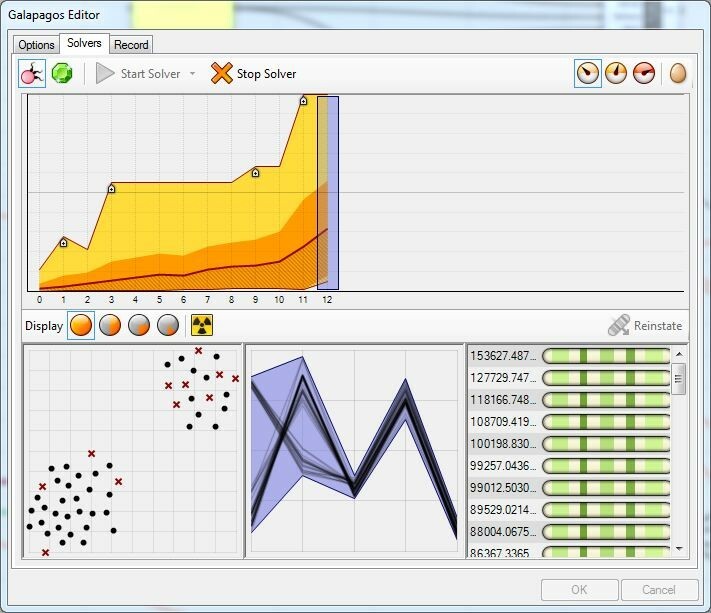 The program allows the user to drive the evolution of 2D branching structures over a series of generations. For each generation, the user picks one figure that is most attractive, and in the next generation a set of new descendant figures are drawn. There are about 500 billion biomorphs in the nine-dimensional space that Dawkins created, and the only way to find any one of them was to evolve towards it from a single, primitive parent. Dawkins writes beautifully about the first night he got the program to run – staying up all night evolving bats, insects, and airplanes – and how he neglected to write a method of saving the biomorphs he encountered. He saw amazing forms during his first night exploring in biomorph land that were effectively lost – without saving their genomes, it was practically impossible to find them again within the vast design space. Aside from the amazing writing about design space navigation, he also developed some incredibly interesting visualization techniques, such as cutting a section through the design space using a hyperplane. (Early 2000s) Scripting Architecture. Rhinoscript and Generative Components open up a new working methodology for architecture and engineering practices. Instead of resorting to ‘click and die’ for design iteration, designers begin to automate the authorship of geometry in their CAD platforms, and to define parametric relationships in their models. Generating new iterations is as simple as changing input parameters and re-running the script – design spaces begin to take shape. (2009 – Present) Rise of the Grasshopper. Grasshopper exposes a huge audience of architects, engineers and designers to computational and algorithmic design. Design spaces proliferate. Galapagos enables optimization workflows, and for the first time gives users a visual representation of the design spaces that their definitions describe. The idea of the design space starts to take root in the AEC mainstream. (2011) Design space navigation / publication research at PAE. 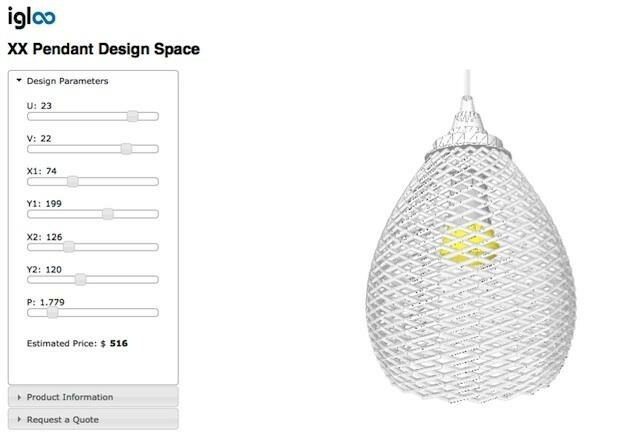 Right around the same time as the rise of the Grasshopper, online ‘configurators’ started to show up (including early versions of Nervous System’s work in the browser) … which begged the question: if BMW, Nike and Nervous System can publish design spaces, why can’t we? I worked on a research project called Igloo in 2011 at the Stevens Institute of Technology Product Architecture Lab along with Matthew Naugle, Nicholas Faust, David Pysch, Nick Mykulak, and Mike Cosentino, which allowed design spaces generated with Solidworks or Grasshopper to be published and navigated on the web. (2012 – Present) GBS parametric runs. 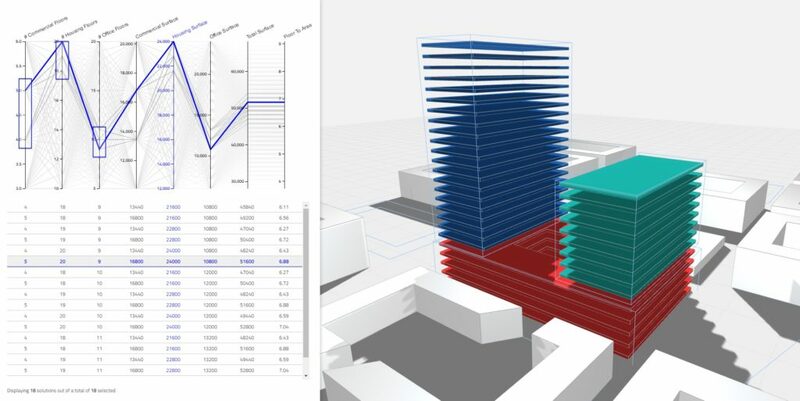 Autodesk releases functionality within Green Building Studio that lets users to upload a single design iteration [from Revit and Vasari] to a web application that would perform a series of parametric energy analysis runs automatically. Using the results of all of these analyses, GBS returns a sensitivity analysis visualization, allowing users to see which design parameters matter the most for potential for energy savings. It’s a specialized case, but the most interesting component is the use of a horizontally scaling web application to generate a design space (more on that below…). The CORE studio worked with the Dynamo and GBS teams at Autodesk to develop Energy Analysis for Dynamo, an open source package for Dynamo which allowed users to set up their own parametric runs, and to include GBS results in optimization workflows. (May 2014) Pollination. A team of hackers developed Pollination at the 2014 AEC Technology Hackathon: an open source tool for managing (and dynamically visualizing the results of) distributed, parametric energy analysis runs using Grasshopper, Honeybee, and Amazon Web Services (to run the whole-building energy analyses on the cloud). This is another early example of a web application generating a design space, but the most interesting development was the use of an interactive parallel coordinates plot to display the results of the analyses in exhaustive detail. The team quickly realized that the UI used to display results could be used to visualize and navigate within any multi-dimensional data set. This insight was the kernel for the Design Explorer. (May 2015) Design Explorer v1. Design Explorer was CORE studio’s first attempt to generalize and extend the ideas that came out of Pollination. We set out to build a single page web application that lets users navigate within multidimensional design spaces, and that gives them graphical representations of both the design space itself and of the individuals within that space. 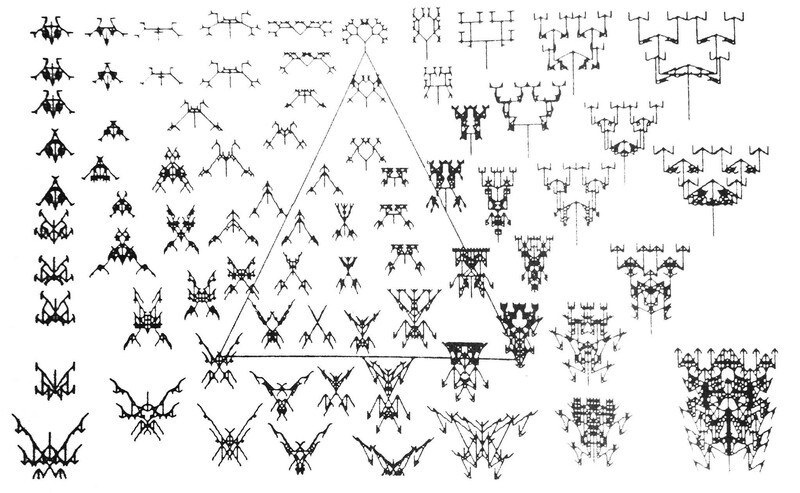 The parallel coordinates plot from pollination was used to visualize and navigate within the design space, and images and/or Spectacles models were used to represent individual design iterations. Navigation using sliders is also available in Design Explorer (it’s just sort of hidden over on the left!). CORE studio released this project under an open source license, in hopes that the burgeoning community of design-space researchers might help to extend the research. 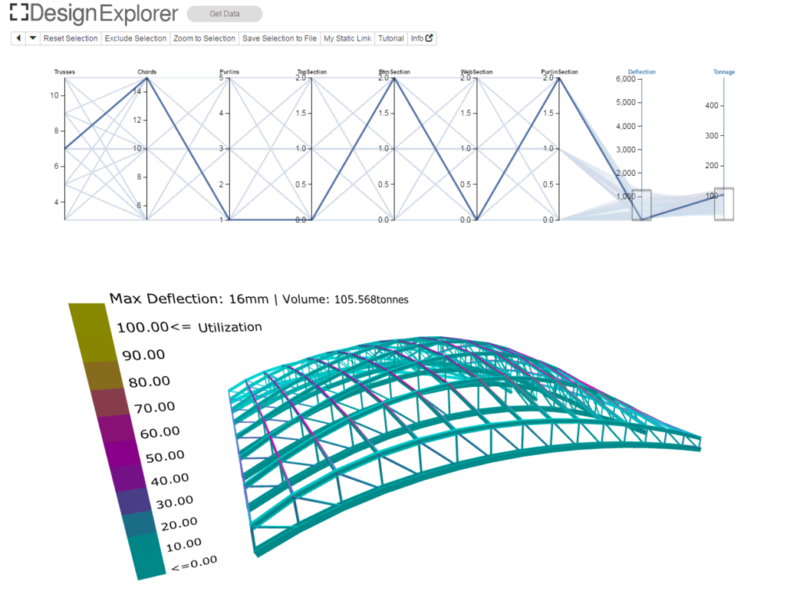 Design Explorer was first presented by former CORE studio Applications Developer Mostapha Sadeghipour Roudsari at the 2015 AEC Technology Symposium (link to Mostapha’s presentation), and a modified version was used to present the results of some early machine learning research by CORE studio Engineer Dan Reynolds at the same event (link to Dan’s presentation). (March 2016) Speckle beta release. Speckle is making some really impressive headway – the CORE studio thinks it’s super exciting! 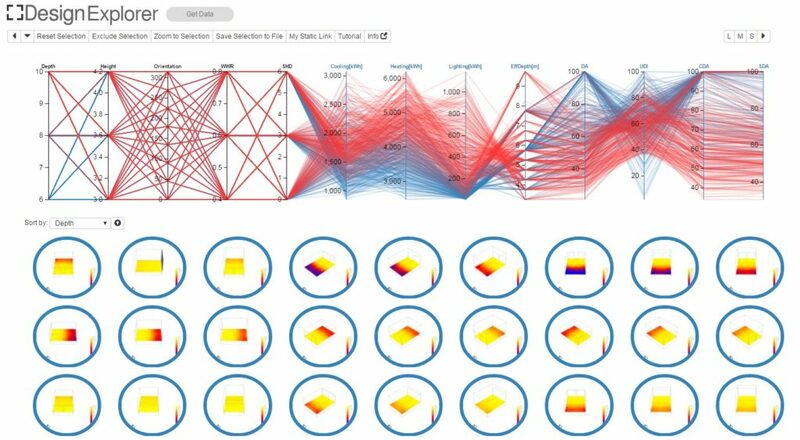 The project aims to allow users to share, display, and explore parametric models in a web browser. Their beta release allows users to export design spaces from Grasshopper and to share those spaces on beta.speckle.xyz. Both slider and parallel coordinates modes are available. Perhaps sweetest of all, the project is open source under the GPLv2 license! They’ve also got a new version cooking that seems to be exploring a streaming model (as opposed to exporting the whole design space). (July 2016) Autodesk Project Fractal alpha release. Another super impressive project from our friends over at Autodesk, Project Fractal. 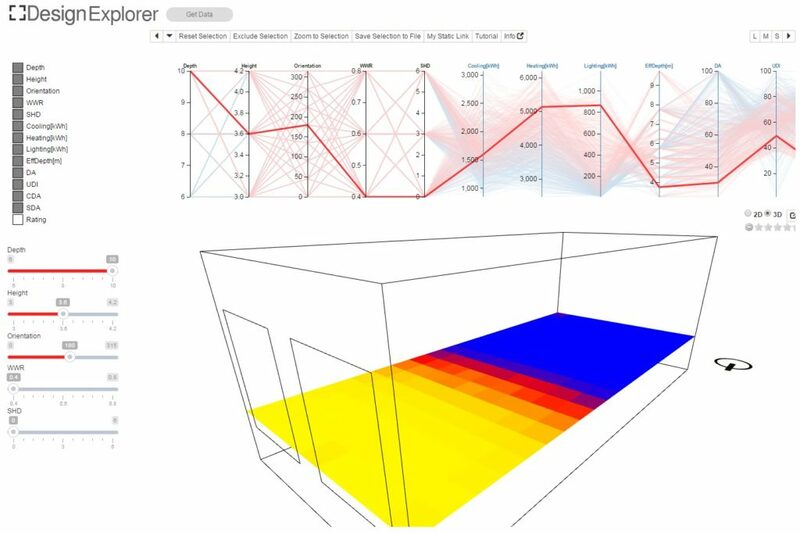 Like Design Explorer and Speckle, sliders and a parallel coordinate plot are used to navigate within a design space that was authored in Dynamo Studio. 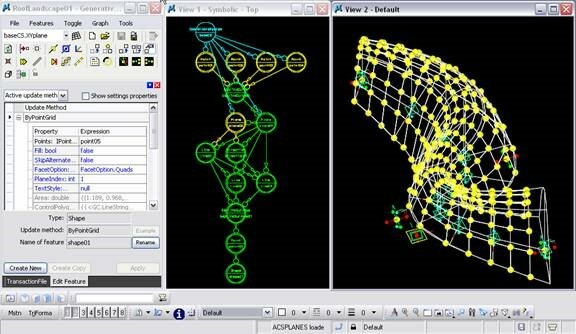 However instead of exporting entire design spaces, Fractal runs Dynamo graphs on the cloud in real time, and stores computed iterations in a database. This is another example of using a horizontally-scaling web application to generate design spaces. This project seems to have branched out of an earlier Autodesk labs project called Akaba – you can read all about both here: http://thebuildinglab.info/. (October 2016) Design Explorer v2. While he was studying with Mostapha Sadeghipour Roudsari at the University of Pennsylvania in the Spring of 2016, Mingbo Peng forked Design Explorer and made a number of improvements. Most notably, he made publication much easier by linking up Google Drive to host [Design Explorer] content and data – this was an absolute nightmare in v1! In his 2011 book Where Good Ideas Come From, Steven Johnson writes about simultaneous invention. It seems to me that we are in the midst of such a period of simultaneous innovation focused on design space navigation. In other words, it’s not a surprise that we aren’t the only group doing R&D along this vector. Since our authoring tools have evolved to let us iterate at an unprecedented scale and speed, we are now in dire need of a new generation of tools that will allow us to navigate within the vast libraries we build; tools that help us find a few good solutions in enormous possibility spaces. Stay tuned for our final post in this series, which will focus on how Design Explorer is being used in practice.